BONN, Germany -- Brazilian President Dilma Rousseff will not unveil her country's greenhouse gas emissions plan for a new international global warming accord when she meets with President Obama this month, a top Brazilian negotiator told ClimateWire. Raphael Azeredo, head of Brazil's delegation to U.N. climate negotiations, said he believes Rousseff's June 30 visit to Washington, D.C., is too soon to expect the country's full contribution to a December deal in Paris. Still, he said, Rousseff will offer key nuggets about Brazil's plan as well as a "strong declaration" with Obama about the urgency of tackling climate change. "It will not be ready by then," Azeredo said of Brazil's intended nationally determined contribution (INDC) to the Paris agreement. 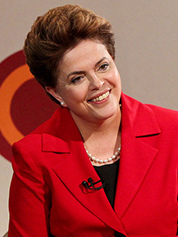 Dilma Rousseff, president of Brazil. Photo by Roberto Stuckert Filho, courtesy of Flickr. Instead, he said, "there will be indications of what Brazil intends" as well as a raft of cooperative measures between the two countries on clean energy development. Meanwhile, analysts familiar with the bilateral negotiations said a long-standing effort by Brazil to end a U.S. ban on its beef is receiving fresh attention as an area ripe for climate potential. Talks are in late stages, sources said, but U.S. officials are just starting to explore whether a beef bargain could yield new Brazilian commitments to end Amazon deforestation. "At the stage that we're in, we're obviously elaborating the text," Azeredo said, declining to talk specifically about potential areas of agreement in any particular sector. "Of course, cooperation between the two countries is something that will always be relevant. These visits at the highest level are a great way to highlight what's being done and push for new initiatives," he said. "Hopefully, when two countries as representative as Brazil and the U.S. make a strong declaration on climate, it can only benefit." U.S. officials were also tight-lipped on details. U.S. Special Envoy for Climate Change Todd Stern said in a statement to ClimateWire: "At the upcoming meeting of their presidents, the United States and Brazil will address the broad range of bilateral issues that engage them. Regarding climate change, the U.S. and Brazil are important players in the global efforts to reduce greenhouse gas emissions and reach a successful agreement in Paris this December." Rousseff's visit marks an important thawing in the relationship between Washington, D.C., and Brasília. The deep freeze set in when whistleblower Edward Snowden revealed in 2013 that the National Security Agency had monitored Rousseff's telephone calls and emails. And climate change is playing a key role in the new dynamics. According to two administration officials, it was no accident that it was the first item both Obama and Rousseff cited as an area of cooperation when they announced the joint visit. Back when relations first began to warm, sources said, a White House memo went out to all the agencies asking for a "wish list" of initiatives that people would like to see with Brazil. Climate change was at the top of most lists. Yet early hopes that the United States might be able to design a major deal with Brazil along the lines of its landmark announcement with China last year -- in which both countries announced their Paris targets -- appear to be hitting roadblocks. For one thing, many noted, with America's target already public, the administration has less to offer to seal a second blockbuster deal. "The U.S. cards are already on the table," said Carlos Rittl, executive secretary of the Observatório do Clima, a consortium of environmental groups in Brazil. What is shaping up instead, officials said, is a set of cooperative measures on a range of measures that will include promises of technical assistance from the United States and financing for renewable energy efforts through export credit agencies and the Overseas Private Investment Corp.
"I think it can be an example of cooperation between leading countries with a lot of renewable energy potential," said Mark Lutes, senior global climate policy adviser at WWF Brazil, adding, "Dilma could see this as a strategic opportunity for Brazil's economy." But beef could sweeten the deal even more, some say. The United States banned Brazilian beef in 2001 after the country failed to show its cattle were free from mad cow disease, and the Brazilian government has been pushing to end the embargo ever since. In 2013, the U.S. Department of Agriculture proposed allowing some importation of beef after the agency concluded that Brazil now has the veterinary infrastructure in place to detect and eradicate an outbreak of foot-and-mouth disease. Climate advocates agree that Brazil now has a strong scientific case to make for ending the embargo and generally support a deal. But with 60 percent of Brazil's deforestation happening because of cattle production, they say, any deal must include conditions ensuring that the beef has not been produced in violation of the country's Forest Code restricting the razing and clearcutting of the Amazon. "With ground beef prices at record highs in the United States, imported Brazilian beef could be good news for consumers firing up their backyard grills this summer, but only if Brazilian beef is safe and sustainable," said Nigel Purvis, a former U.S. climate negotiator who now leads the consulting group Climate Advisers. "If the United States lifts its import restrictions on Brazilian beef, the United States and Brazil should agree publicly that all beef exported by Brazil to the United States must be sustainable and legal," he said. Doug Boucher, who directs the Union of Concerned Scientists' Tropical Forest and Climate Initiative, said one potential deal in the works would see Brazil vowing to ensure strong enforcement of the Forest Code and possibly providing some certification that any beef exported to the United States was not done in violation of forest protection laws. "If that happens, I think it would be quite a good thing for the climate," Boucher said. But the beef industry continues to have strong concerns about the end to an embargo. In a statement to ClimateWire, National Cattlemen's Beef Association Vice President of Government Affairs Colin Woodall said his group supports trade but questioned the science surrounding the safety of Brazilian beef. "Brazil and Argentina have a history with foot and mouth disease (FMD), and we have strong concerns on the lack of safeguards that Brazil and Argentina have to make sure that the disease is not brought into the United States. FMD is highly contagious and we simply cannot jeopardize the health of the animals in our domestic herd. It is a risk we are not willing to take and therefore we will continue to push back against these rules," Woodall said. As that debate plays out, activists say they are increasingly hopeful that the Obama-Rousseff meeting will build momentum toward the Paris talks -- even if Brazil does not put its entire emissions plan on the table. Rittle said he hopes to see at least some indication of the type of targets Brazil will make. Environmental groups are urging the Brazilian government to announce an economywide absolute emissions cut rather than a reduction from business-as-usual trends or a carbon efficiency target. "If we have as a result of this meeting Brazil announcing it will make an absolute emissions target, I don't think it will be a small thing," Rittl said. "That will be a big announcement." Meanwhile, he and others argue that with Rousseff's administration rocked by corruption charges and an economic downturn, positive attention from a climate agreement and a possible economic infusion to boost solar, wind and other renewables in Brazil could offer a much-needed public relations boost. "Dilma needs good news, and this is a platform that can give her good news. And not just headlines, but economic opportunities," said WWF's Lutes. "I think the meeting can be really important."